At Air International, computer simulation has long been viewed as a key competitive advantage, permitting early evaluation of many different design alternatives before building a prototype. With EASA, Air International has leveraged these benefits by creating custom, task-specific applications simplifying the use of many CAE workflows, including tools such as Fluent, NX/NASTRAN, and CATIA. 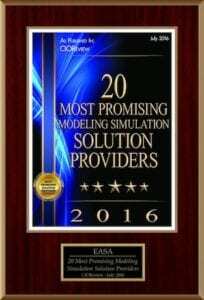 Furthermore, expert knowledge was embedded into the streamlined user interface, making modeling and simulation available to engineers and designers with little or no CAE experience while also significantly accelerating the process for experienced users. Air International Group is a tier-one supplier of heating, ventilation and air conditioning (HVAC) systems to the world’s automotive industry. Air International Group has design centers in the United States, China, and Australia and employs a “follow the sun” methodology that provides engineering capabilities on a 24×7 basis from its design centers around the world. 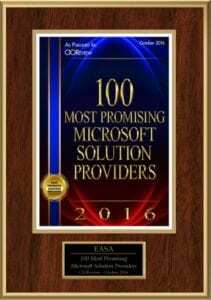 This requires both a robust PLM system and unified, globally accessible applications and engineering methodologies. Air International has long made extensive use of Product Lifecycle Management (PLM) tools, particularly in the design and analysis of air conditioning systems, in vehicle cabins, and for under-hood thermal management. Computational fluid dynamics (CFD), finite element analysis, solid modeling and other tools are frequently used. The company’s global engineering strategy has focused on responding quickly to customers and making engineering decisions based on simulation data rather than “best guess”. When the company first began using simulation, it followed traditional methods; design engineers create concept designs and then pass them “over the wall” to analysts who create models and run simulations to determine their performance. Then, typically several weeks later, the analysts hand the results back to the design engineer. The problem with this approach is that the analysts rarely have complete familiarity with a particular design; there is a tendency to simply pass the analysis results back to the designer rather than making suggestions for improving the design. It was recognized that analysts would never possess the same level of product knowledge as the design engineers; nor will the design engineers ever possess the specialized skills required to work directly with high-end analysis tools. To address these issues, Air International made a strategic decision to change the role of the analyst and designer by putting CAE tools in the hands of design engineers. The concept was to automate many of the non- value added steps involved in the process while at the same time capturing the expertise of the analysts to define robust processes and validated methodologies that would provide design engineers with instant feedback. “We evaluated a number of different tools and selected EASA, a codeless application development platform” said Richard Hoyle, Design Manager. “EASA demonstrated the ability to not only automate but also to drastically simplify the use of our main CAE applications, such as Fluent, NX/NASTRAN, Unigraphics and CATIA. EASA’s codeless development environment makes it possible for our designers and analysts to create and deploy custom tools with “built-in” expertise without support from programmers. Finally, we like the ability to automatically document our engineering analysis which makes it possible to easily satisfy ISO/TS16949 documentation for process control requirements.” Future plans include full integration of EASA with existing PLM/PDM systems. Air International has now created custom EASA applications for many of its most important design tasks. These custom applications act as a simplifying layer over the CAE tools and drastically reduce the complexity of the analysis tasks by eliminating the need for the design engineer to learn and interact with many different programs. 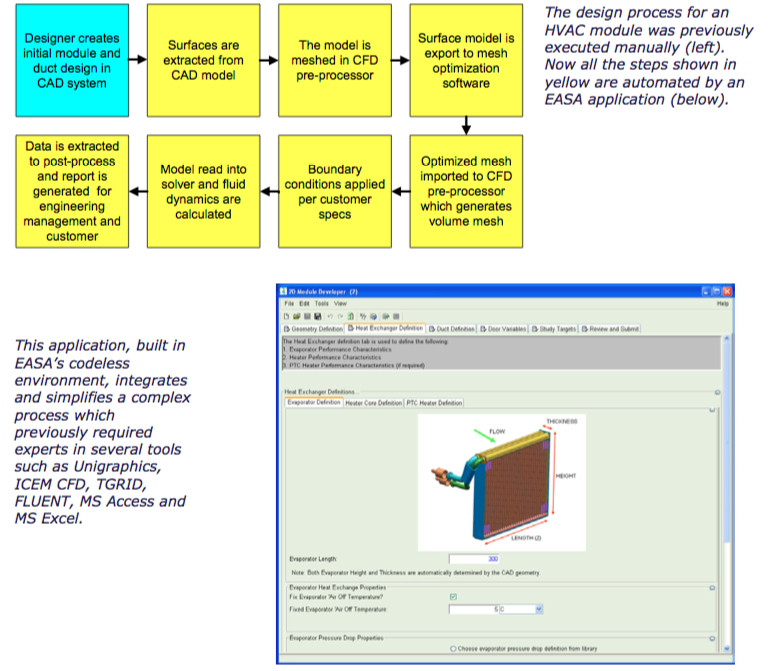 When designers use an EASA application, they are implicitly applying “built-in” expertise.